Do you need a 0.6M12-P0.5? We can help you find it at a competitive price! 1.85 x 1.10 x 0.47"
ULTRAVOLT® M SERIES MINIATURE, MICRO-SIZED HIGH VOLTAGE BIASING SUPPLIES Single-output, micro-sized HV modules The miniature, micro-sized M series is the ideal solution for applications requiring biasing voltage ranging from 3 0 to 3000 V and very small current—only 16.4 cc (1.00 in ). Less than 12.7 mm (0.5") high, these modules are ideal for low-profile applications. Features Typical Applications › Seven models from 0 to 600, › Bias supplies 1000, 1250, 1500, 2000, 2500, › Electrostatic chucks or 3000 V › Hand held x-ray ﬂorescence › Output power: 0.5, 0.8, or 1 W (XRF) › Tight line/load regulation › Avalanche photo diodes (APD) › Arc and continuous short › Photomultiplier tubes (PMT) circuit protection › Silicon detector (SiD) › Self-restoring output voltage › X-ray ﬂat panel detector (FPD) › Low cost › Ionization chamber detector › Miniature and lightweight › Voltage monitoring › Low ripple (0.01% peak to peak) › Optional ﬂying lead for high voltage output PARAMETER SPECIFICATIONS UNITS 5 ±0.5 (2 to 3 kV ONLY), 12 ±1, 15 ±1 (600 V to 1.5 kV ONLY), or 24 ±2 VDC Input Voltage Vin (Pins 1 and 2) 5 (2 to 3 kV ONLY) 12 V Input Voltage No load: 55, full load: 450 No load: 45, full load: 200 mA Input Current Fixed positive and fixed negative - Polarity 0 to 600 0 to 1000 VDC Output Voltage 12 15 24 12 15 24 VDC Input Voltage 0.5 0.8 1 0.5 0.8 1 W Output Power 0.83 1.33 1.67 0.5 0.8 1 mA Output Current 0 to 1250 0 to 1500 VDC Output Voltage 12 15 24 12 15 24 VDC Input Voltage 0.5 0.8 1 0.5 0.8 1 W Output Power 0.4 0.64 0.8 0.33 0.53 0.67 mA Output Current 10 to 100 K (potentiometer across Vref. and signal ground, wiper to adjust) - HV Setting < 0.01% of full output voltage for no load to full load VDC Load Voltage Regulation < 0.01% of full output voltage over specified input voltage range VDC Line Voltage Regulation < 0.01% at full load V pk to pk Residual Ripple 100 ppm/°C for the max output voltage after starting and over temperature range 0 to - Temperature Coefficient 50°C +1 V/1 kV max or -1 V/-1 kV max according to model polarity output impedance = 200 kΩ - Output Voltage Monitoring (600 to 1500 V) ±1% 12 to 24 V input only: 0 to +5 V±2% VDC Output Voltage Monitoring (2 to 3 kV) 5 V inputs: 0 to +2.5 V±2% 12 to 24 V input only: 5 V ±1%, TC: 100 ppm/°C, max output current: 1 mA - Reference Voltage 5 V inputs: 2.5 V ±1%, TC: 100 ppm/°C, max output current: 1 mA -10 to +65, full load, max Eout, case temp °C Operating Temperature -40 to +70 °C Storage Temperature Arc and short circuit protection - Safeguards Flying lead for HV output - Options Enable/disable (ON/OFF): 0 to +0.5 V enable, +2.4V to V_input disable (default = - Enhanced Interface (-EI) disable) Option (2 to 3 kV Only) Output current monitor (5 V input only): 0 to +2.5 V ±2% Output current monitor (12 to 24 V input): 0 to +5.0 V ±2% - PARAMETER SPECIFICATIONS UNITS 5 ±0.5 (2 to 3 kV ONLY), 12 ±1, 15 ±1 (600 V to 1.5 kV ONLY), or 24 ±2 VDC Input Voltage Vin (Pins 1 and 2) 15 (600 V to 1.5 kV ONLY) 24 V Input Voltage No load: 40, full load: 190 No load: 35,k full load: 160 mA Input Current Fixed positive and fixed negative - Polarity 0 to 2000 0 to 2500 VDC Output Voltage 5 12 24 5 12 24 VDC Input Voltage 0.5 0.8 1 0.5 0.8 1 W Output Power 0.25 0.40 0.50 0.20 0.32 0.40 mA Output Current 0 to 3000 VDC Output Voltage 5 12 24 VDC Input Voltage 0.5 0.8 1 W Output Power 0.167 0.267 0.333 mA Output Current 10 to 100 K (potentiometer across Vref. and signal ground, wiper to adjust) - HV Setting < 0.01% of full output voltage for no load to full load VDC Load Voltage Regulation < 0.01% of full output voltage over specified input voltage range VDC Line Voltage Regulation < 0.01% at full load V pk to pk Residual Ripple 100 ppm/°C for the max output voltage after starting and over temperature range - Temperature Coefficient 0 to 50°C +1 V/1 kV max or -1 V/-1 kV max according to model polarity output impedance - Output Voltage Monitoring (600 to 1500 V) = 200 kΩ ±1% 12 to 24 V input only: 0 to +5 V±2% VDC Output Voltage Monitoring (2 to 3 kV) 5 V inputs: 0 to +2.5 V±2% 12 to 24 V input only: 5 V ±1%, TC: 100 ppm/°C, max output current: 1 mA - Reference Voltage 5 V inputs: 2.5 V ±1%, TC: 100 ppm/°C, max output current: 1 mA -10 to +65, full load, max Eout, case temp °C Operating Temperature -40 to +70 °C Storage Temperature Arc and short-circuit protection - Safeguards Flying lead for HV output - Options Enable/disable (ON/OFF): 0 to +0.5 V enable, +2.4V to V_input disable (default = - Enhanced Interface (-EI) disable) Option (2 to 3 kV Only) Output current monitor (5 V input only): 0 to +2.5 V ±2% Output current monitor (12 to 24 V input): 0 to +5.0 V ±2% - FLYING LEAD OPTION -WS Note: Pins 7 and 8 are available for 2 k to 3 kV units with enhanced interface option ONLY. Drawing views: third angle projections. Measurements are in inches (millimeters). PHYSICAL SPECIFICATIONS Steel, tin-plated thickness 0.5 mm (0.02") Construction Insulation: fully potted in an epoxy resin 16.4 cc (1.00 in³) Volume 35 g (1.23 oz) Weight Tolerance ±0.76 mm (0.030") Overall ±0.38 mm (0.015") Pin to Pin ±0.51 mm (0.020") Pin to Tab ±0.25 mm (0.010") Tab to Tab Notes: 0.47 mm (0.019") round pins, length: 3 mm (0.12"), spacing: 2.54 mm (0.1") PCB mounting through 4 mounting tabs, length: 5 mm (0.2"), width: 1.5 mm (0.059"), thickness: 0.5 mm (0.02") Optional flying lead for HV output: coaxial cable (RG178), diameter: 2 mm (0.079"), length: 500 mm (19.685") CONNECTIONS Pin Function POSITIVE POWER INPUT 1 POWER GROUND 2 SIGNAL GROUND 3 REMOTE ADJUST INPUT 4 REFERENCE VOLTAGE 5 VOLTAGE MONITOR 6 CURRENT MONITOR (available with -EI option only) 7 ENABLE (available with -EI option only) 8 HV OUTPUT 9 Note: Mounting tabs must be connected to ground. 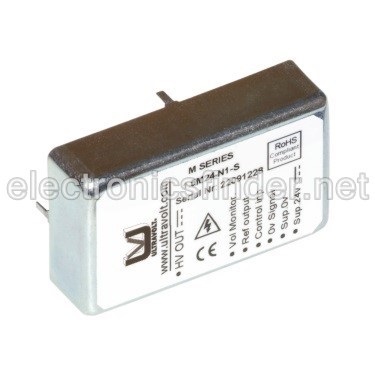 ORDERING INFORMATION 0 to 600 VDC Output 0.6 M Type 0 to 1000 VDC Output 1 M 0 to 1250 VDC Output 1.25 M 0 to 1500 VDC Output 1.5 M 0 to 2000 VDC Output 2 M 0 to 2500 VDC Output 2.5 M 0 to 3000 VDC Output 3 M 5 VDC Nominal (2 to 3 kV only) 5 Input 12 VDC Nominal 12 15 VDC Nominal (600 V to 1.5 kV only) 15 24 VDC Nominal 24 0.5 W Output 0.5 Power 0.8 W Output 0.8 1 W Output 1 Tin Steel Case (Standard) Case Positive Output -P Polarity Negative Output -N Shielded Flying Lead for HV Output (600 V to 1.5 kV) -WS Option Flying Lead for HV Output (2 to 3 kV only) -W Current Monitor/Enable Pin (2 to 3 kV only) -EI Example: 1.5M24-P1-WS Voltage Option IEC-60950-1 Type Model Power Non-RoHS compliant units are available. Please contact the factory for more information. Input Polarity Popular accessories ordered with this product include the PCB-CONN-M/V. The M series is not available in all territories. Please contact Advanced Energy for details concerning sales in your area. For international contact information, visit advanced-energy.com. ENG-HV-Mseries-230-J 11.16 Specifications are subject to change without notice. ©2016 Advanced Energy Industries, Inc. All rights reserved. Advanced Energy® AE®, and UltraVolt® are U.S. trademarks of Advanced Energy Industries, Inc.